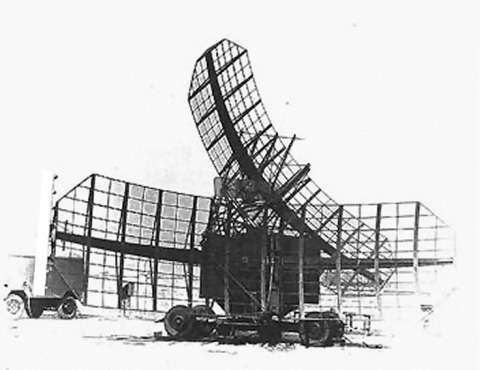 This large 2-D ground-controlled interception and search radar is trailer-mounted equipment that has two large truncated paraboloid reflectors with clipped corners. En approximate height determination of the target could be carried out by the sloping position of the upper antenna (the so called V-beam). If the target on the screen is shown twice, this means that the accompanying aircraft flies at a larger height. The further away this two parts of the target were shown on the screen, the targets height was the larger. The attached to the left corner of the lower reflector (in the pictures center) vertically beacon is the compensation antenna of the included identification friend-or-foe secondary radar unit (NRS 20). This “active answer” should make a better identification of own airplanes possible and was established with the introduction of the MiG 21. Due to the possibilities of digital target recognition and local tracking accompanied by a modern Plotextraktor this radar got a revival and was reissued under the name 1L117. The plot extractor can process up to 200 targets simultaneously. The accuracy in height determination is 400 m.